The knit stitch looks like a 'V' in your work. When it is on your needles, there will not be any type of bump of yarn up against the needle, as in a purl stitch. It's important to know that a knit stitch, when you turn the needles around (like when you get to the end of a row) becomes a purl stitch. Similarly, a purl stitch, when turned around becomes a knit stitch. They are opposites of each other. Learning to identify knit and purl stitches can help you avoid making common mistakes, like losing track of where you are in your pattern. If you can identify what knit stitches look like on a previous row, you can see where you need to 'knit into knits, and purl into purls' for ribbing. 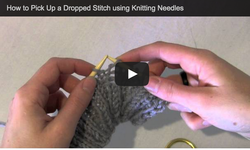 Familiarize yourself with purl stitches and what they look like by viewing the video on this page. The garter stitch looks similar to the wrong side (purl side) of stockinette stitch fabric but is in fact different. Learning to identify purl stitches can help you to identify where in a pattern you are. The rib stitch is often used to keep the brim of a hat or the cuffs of gloves laying flat. It is created by alternating knit and purl stitches in the same row. The yarn over (YO) stitch is the easiest stitch in knitting. It can be tricky to understand on the purl row, however. An accidental increase that is an incomplete stitch is created when the yarn isn't pulled all the way through the loop on the needle. Dropped stitches happen and often you won't notice them until rows later. Learn to pick them up with your knitting needles.